It is possible that two events can take place just a short different from each other as if they were being played out on totally different planets – or is it a case of parallel universes? First story: All the news is looking good for the future of Haig Park. The work on the master plan has progressed at a pace and all indications are that those running the show are listening. That may sound like something normal but for many who have suffered through the master plan processes, it is indeed a very welcomed change. I suspect that this master plan is not one of the infamous LDA style projects that pretended to be about getting community views whereas the real aim, as most eventually found out to their neighbourhood peril, was about sale of some land – often community lands. The work on Haig Park is starting to come up with some interesting and original solutions. I like the sound of those ‘rooms’ or zones where various activities can take place. I wish them well in dealing with the heritage lobby that will probably try to not have those lines of trees altered. The question should not be about defending those particular trees, but about making sure that enough greenery is put back. The ACT Government agency running this process is to be congratulated. Let’s hope that the delivery stage is not too far away and that the community aspirations will be addressed. Second story: Meanwhile in Dickson there has been endless discussions about the future of the Dickson Parklands. The latest episode can only be described as being Machiavellian politics at work. How is it that the same government that is overseeing successful master plan processes for Haig Park – one suburb away – can also be carrying out duplicitous actions to undermine the documented wishes of the local communities? There has been numerous ‘consultations’ with residents, being very well attended gatherings. All ideas were put forward for those running the sessions to consider and then taken away so that they could bring back ideas based on those aspirations. Instead what people heard was how the LDA had taken the words of the residents and somehow – totally mysteriously – interpreted that to mean that site needed to be sold off for loads of housing. People had to be held back from throwing their chairs at those who had pretended to have ‘consulted’. As you can guess those ‘consultations’ stalled and not much was heard for a couple of years. Meanwhile yet another building caught fire on the site. 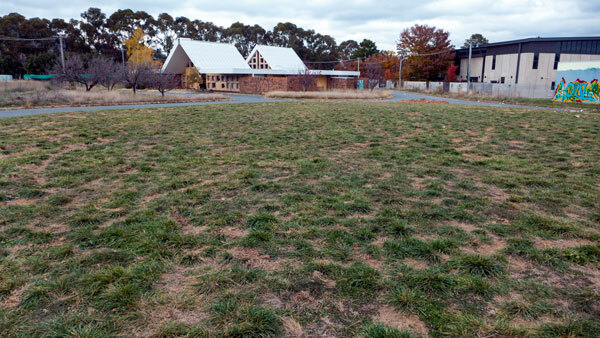 Then a week ago the new management of North Canberra Community Council (NCCC) suddenly dropped the topic of the Parklands onto an agenda – just days out from a meeting. That short notice meant that many people with an interest in the Parklands were not able to attend. This is a hot topic given that it is the last piece of community land in this area and its importance is increasing as the surrounding suburbs are undergoing major changes resulting in a rapid increase in residents. There was a very well researched presentation (hastily put together given the short notice) by Jane Goffman on the history of the site and how we ended up where we are now with a complex parkland site being used for a variety of uses and how things are being plonked onto the site – without – a master plan. 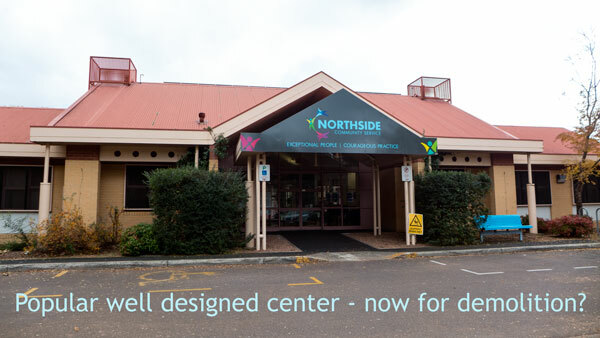 This despite years of request for such a master plan to be undertaken before any more changes are made to the whole site known locally as The Dickson Parklands –or by the cold and clinical bureaucratic title – Section 72 Dickson. The term “parklands’ represents the nature of the site – being loads of trees and some grasslands – but also a mix of community and cultural facilities. Once the presentation was over, we thought we were to discuss how to get a master plan undertaken. To everyone’s surprise we were told that master plans have been deemed to be no longer possible and that we do not need one for the Dickson Parklands. The shock was that the statement came from those who recently took over the running of the NCCC. Their words were quickly backed up by a Labor Minister present – who had said that she was attending as a resident. However she did not stay in resident mode for long. 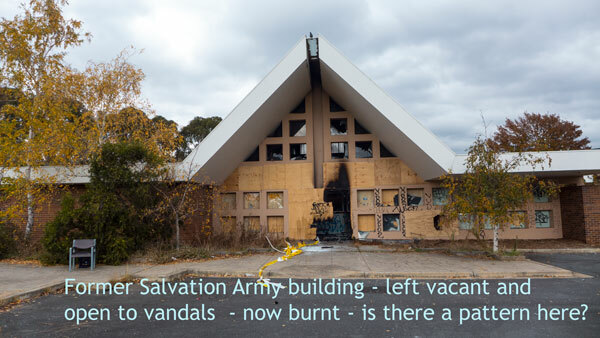 She boldly stated that her government was to demolish the community centre to build another Common Ground ‘community’ tower as had been recently built in Gungahlin. Apparently it was an election promise (surprise to most) and so they have to deliver it. This despite requests from the local community for no more changes (new buildings etc) before a plan the future of the Parklands is in place. This is not opposition against another Common Ground – but a plea for planning rather than just plonking things on the site in an ad hoc manner. But I am so glad she and her party hadn’t quietly promise to build a nuclear power plant on the Parklands. The new NCCC leaders were onside with the attending Minister and all spoke with the same voice. Have we redefined community representation? Is this the last gasp of the Machiavellian development processes as we have all suffered through the LDA’s infamous crash through and destroy planning processes. The LDA mantra was well known: “We came (when residents least expect it), we saw (wonderful community open spaces/ land banks), we sold (to friendly developers) and concreted all that was available (away with all those pesky trees)”. On the night it sounded as though the newly locally elected Labor politician and NCCC executive shared a lack of enthusiasm for doing what the community has frequently requested. That is: do a Master Plan (any planning would be a change) – to consider potential community and cultural facilities; to enhance the place for the surrounding growing neighbourhoods; and maybe plan for some aged care housing among other options – all that to be teased out in an open and honest master plan process. 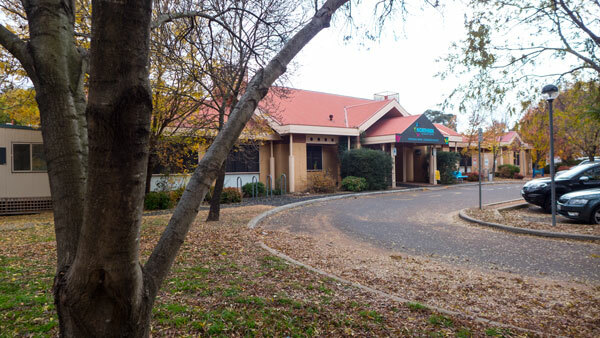 Yes dear readers – these two stories of parklands are happening just a couple of kilometres away from each other. The Haig Park story may be a success story to be celebrated (Yah!). Option Two: Given the perception that the NCCC is more influenced by the government than by residents on this issue, is it time for residents to form an action committee to halt the further erosion of the Dickson Parklands and to gather support for a MASTER PLAN? I do prefer the first option – so let’s see if he walks his talk.